In recent years we’ve been seeing increasing efforts to create robots that show emotion or offer affection to people they interact with. Lovot is a new robot out of Japan with such an aim in mind. Created by Tokyo-based Groove X, Lovot — which comes from combining “love” and “robot” — is a cute companion robot that’s been in development for the last three years. It’s just over a foot tall and in many ways resembles a child’s cuddly toy. But Lovot is trying to be something altogether smarter, as beneath its soft covering you’ll find numerous sensors that detect human touch, though quite how it responds isn’t entirely clear. There’s also a less-hard-to-miss camera perched on its head for navigation. Instead, it “begs for attention and gets in the way of those it lives with,” a description that to some might sound more like a warning than a selling point. When you cuddle Lovot, you will, according to the company, “feel a sense of relief [and] contentment.” You’ll even get “a warm feeling inside” when you hold it, though it’s not clear if this is down to Lovot’s internal battery heating up or your own emotional response. Perhaps both? Lovot’s website shows the robot mostly in the arms of happy-looking kids, though there’s also a photo of a woman doing yoga as two little Lovots trundle around her within petting distance. The promotional video, meanwhile, reveals the robot to be more lively than you might expect, with its expressive eyes and a range of body movements. 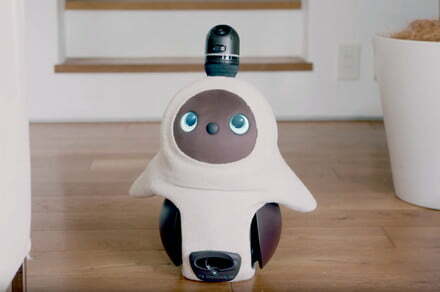 In aiming to be the object of your affections while offering affection itself, Lovot joins other companion robots such as Aibo, Sony’s relaunched robotic mutt, and Paro, a robotic seal that’s used to reduce patient stress in some care homes in Japan. Groove X CEO Kaname Hayashi has extensive experience with these kinds of machines, as he also worked on the design of SoftBank’s Pepper robot, an android capable of understanding human emotions. You can pre-order Lovot this month for a hefty $3,100, but it won’t be shipped until early 2020. A set of two costs $5,300, with shipping expected to begin a little earlier, in the fall of next year.